The chart pattern party ain’t over yet ‘coz I’m serving up a couple more, namely a rectangle on AUD/JPY and a channel on GBP/USD. Check ’em out! 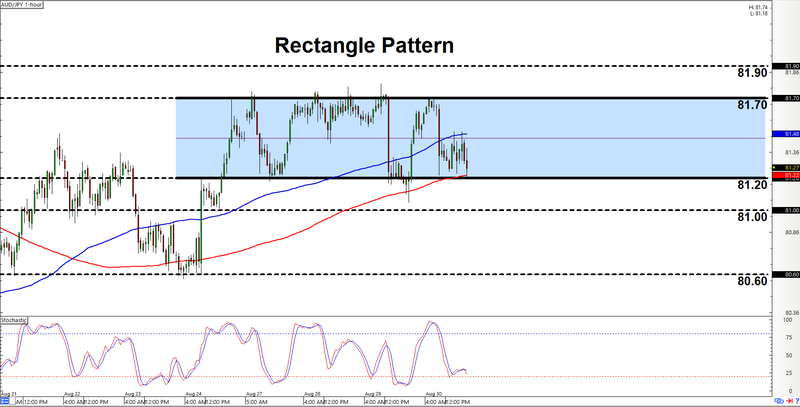 AUD/JPY has been trading sideways while respecting resistance at 81.70 and support at 81.20, which gives us a 50-pip trading range or rectangle pattern to play with. And if you’re lookin’ to trade within the range, then heads up ‘coz the pair is currently testing the rectangle’s support at 81.20. And there’s a good chance that support may hold. After all, stochastic is moving back up after visiting the oversold area. Moreover, the 200 SMA appears to be acting as dynamic support. If support does hold, then that would likely mean that bulls will be gunning for the rectangle’s resistance at 81.70. And since them moving averages are still in uptrend mode, there’s even a chance for a topside rectangle breakout, which would be confirmed by clearing 81.90 on strong bullish momentum. However, there’s always a risk that support may fail to hold. And in the even of that unlikely scenario, then a move lower past 81.00 would invalidate the rectangle. There’s an area of interest nearby at 80.60, though, so y’all may wanna keep a close eye until the pair also moves lower past that. Okay, gonna keep it real with y’all. 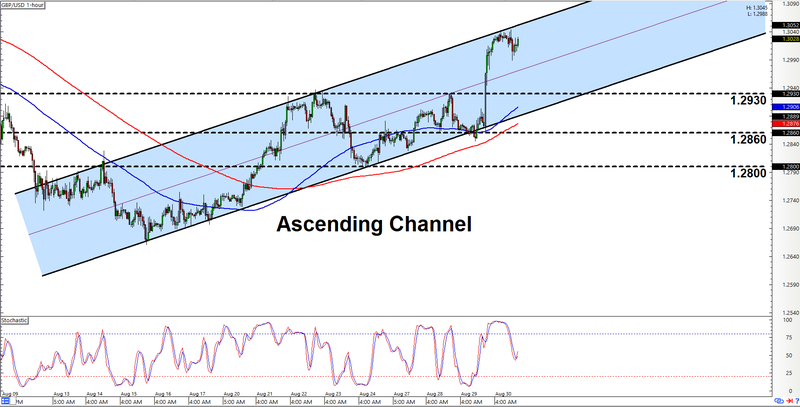 That there ascending channel on GBP/USD’s 1-hour chart ain’t exactly fresh since that chart pattern was actually discovered two days ago. And if y’all can still recall, the pair was testing the mid-channel area at 1.2930, but I told y’all that there may be a chance that the pair may pull back a bit towards the channel’s support, which was at 1.2860 back then. Well, the pair did pull back to 1.2860. More importantly, the pair then spurted higher and tested the channel’s resistance area. And if you were able to ride that, then congratulations on bagging over 180 pips. Aww, yeah! And since the channel’s still intact, and since the channel’s support appears to be holding, today’s play is therefore to wait for the pair to move back down to test the channel’s support at 1.2930 and then start lookin’ for opportunities to go long again. You can look for opportunities to go short at current prices and shoot for the channel’s support at 1.2930, but such a setup is extra risky, so only go for it if you’re gangsta enough. Also as always, do keep in mind that there’s always a chance that the channel may get invalidated. The pair would need to smash lower past 1.2860 and 1.2800 in order to do that, though.